During your self-catering holiday in Morzine, you could have up to 7 hours a day on the slopes so choosing the best equipment is essential. For all our Alptitude guests we highly recommend www.allmountainrental.com, a specialist ski and board hire company based in Morzine. Like us, they are an independent company dedicated to providing you with the best possible service in the area. They have great equipment – the best and most recent models from the leading manufacturers for beginners through to expert. They can also rent you helmets to keep you safe on the slopes! Premium range – New adult skis, boards and boots at the start of the season. In addition, the boots have “Superfeet” orthotic footbeds significantly improving comfort, stability and performance. This is unique in Morzine. Standard range – A less expensive option, made up with great quality equipment from the previous season. The service is second to none and completely hassle free. Book on line to get a 20% discount off normal resort prices. As a guest of Alptitude, the kit is reserved, expertly serviced, set up and delivered to one of your self catered Chalets & Apartments when you arrive in Morzine. They bring spare kit in case changes are needed, and they also collect everything at the end of your holiday from your chalet of apartment. 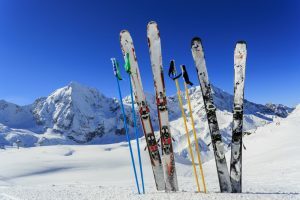 If you are thinking of buying kit in Morzine, All Mountain Rental also have an excellent test centre where you can try out and compare the latest skis and boards. They also rent and sell off-piste safety equipment and touring skis.